Wishbone Day: What is the difference then (2010) and now (2012)? What is the difference then (2010) and now (2012)? Awareness makes a difference! This is the tagline for Wishbone Day. We see it on facebook, twitter, on the website, in the videos, on t-shirts and flyers. But what does it really mean? and What does Wishbone Day mean to me? Let me share with you how Wishbone Day has made a difference to me personally - as a parent and a Wishbone Day Regional Liaison as well as to our OI support group here in the Philippines. Back in 2010, it was the Wishbone Day t-shirt which was the very first thing that drew our group here in the Philippines together. Wishbone Day gave us a sense of belonging and confidence that there is something to look forward to. It gave us hope that our children could have a better quality of life and that we as parents can actually do something. Almost two years on and with the support and guidance of the staff at the Institutes of Human Genetics (IHG) at the National Institute of Health, we are still here, bigger and stronger with a positive outlook and smiles on our faces as we celebrate Wishbone Day in 2012. Besides our group at the Philippine General Hospital, we now have four Satellite Infusion Centers in the different areas of the country. This was possible with the dedicated efforts of our doctors at the IHG, the cooperation of the attending doctors at the satellite infusion centers and the trust of the parents. Awareness in our country made a BIG difference! It gives us hope and confidence, that even a third world country like ours, we can step up and rise above the challenges that OI brings with a positive attitude! Awareness has lifted us from confusion and passivity to positivity and reality. As I have always said, this is the best gift that we can give to our children and the generations to come. It is my pleasure and honour to be part of the first Wishbone Day Team in 2012. I have enjoyed our Wishbone Day Headquarters workspace on Facebook and the friends I've made there. I have learnt so much from Jo and the team as well as from the fellow Asians I have the privilege to communicate with, about Wishbone Day and OI. Raising awareness is so much more than plain, simple telling people something. You touch people at a deeper level. 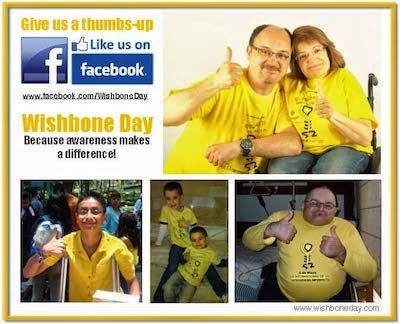 It's about giving parents, kids, adults and community something deeper and helping them realise, Wishbone Day is more than an individual thing - it is for ALL of of us. I have enjoyed the journey this year. It has been exciting to see not only the developments in the Philippines, but also in Nepal and the difference Wishbone Day has made to people in that country as well.